The media module in the IP.Content ACP section allows you to quickly and easily manage multimedia files you may need to use with IP.Content. While you can certainly upload your files through FTP, or link to offsite files, you may find it easier to upload the files using the media section of the ACP, and then copy the links for use within pages, templates, and blocks. Media files uploaded through the IP.Content Media Manager are also easily inserted using the Template Tag helper window available when editing pages, blocks and templates with just a single click. From within the media module, you can create folders, upload files, move files and folders, rename files and folders, and delete files and folders. When viewing a listing of files you will see a preview (if the file can be previewed), and selecting a file will present some other pertinent details. You can also right click on the file and use your browser's "Copy Link" option to quickly get the link to the file. 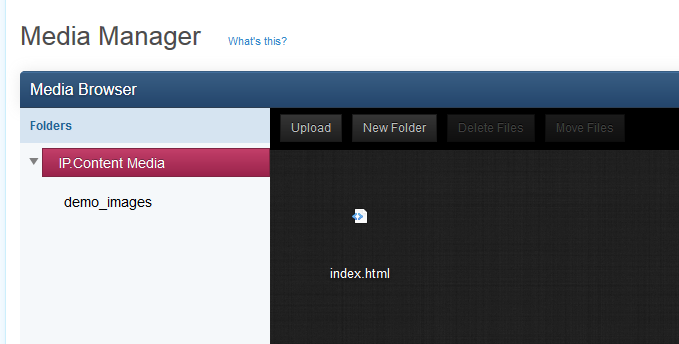 This tool can be a timesaver when you simply need to upload an image quickly for use within a page, block or template. The media folder is defined in the media_path.php file in your forum root directory, giving you the freedom to move and organize your paths as needed.